Up ‘N’ Under is the third play at Oldham Coliseum within the last year based around a football or rugby club and for my money, by far the best of the three. In this play, the characters are rounded individuals who clearly love rugby. This is not to the exclusion of almost everything else and so rather than being a study in obsession, Up ‘N’ Under is a funny story, following on a similar tack to ‘The Full Monty’ (which did not itself come out until thirteen years later). Comparisons can also be drawn with the 2006 Vince Vaughan movie, ‘Dodgeball’. John Godber is second only to Alan Ayckbourn as the most performed living playwright in the UK and with good reason because he has a habit of not just creating funny and credible characters but really getting inside the various worlds he tackles. A good example is ‘On the Piste’, which anyone who has been skiing in the Alps can easily identify with but there are many others, a couple of personal favourites being ‘Teechers’ (about life in a school) and ‘Perfect Pitch’ (about caravanning). 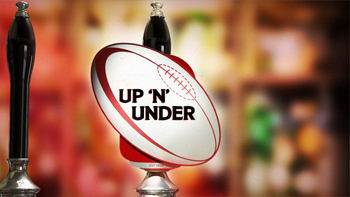 The inspiration for Up ‘N’ Under came when Godber moved to Hull in the early 80’s at a time when the local team was doing well but having played the game himself, Godber gives the game an authenticity which shines through the script. Aside from Rugby itself, there is a clear aim to give a gritty North of England touch to the story, and it is no co-incidence the rugby played here is League and not Union. The teams are based around pubs and there is certain charm to the importance the characters place on this humble league. For them, it is their world and effectively the World Cup in microcosm. The background story is very basic but this is of no importance because the play moves along from the start at a quick pace, building up to a true climax of epic proportions, brilliantly choreographed and very funny. Godber has never shied away from giving Directors production headaches (in ‘On the piste’, a usable ski slope and chairlift were called for!) and in Up ‘N’ Under, we are treated to a well-equipped gym and an actual game of rugby. I won’t tell exactly how the effect is created except to say it is very cleverly done, with great comedy timing. Subtle, well-chosen music clips enhance the atmosphere and even if you don’t like rugby (which I personally do not), the overall spectacle is well worth watching. 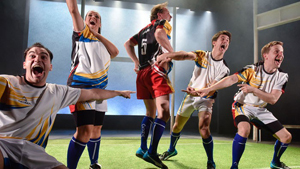 This play was directed by Chris Lawson, who also directed ‘Jumpers for Goalpost’ about a minor-league gay football team but Up ‘N’ Under is in a totally different league (no pun intended); I really enjoyed this play. Jeffrey Harmer, who earlier this year starred as an MP in the superb parliamentary farce ‘Out of Order’ by Ray Cooney, demonstrates great versatility by moving here to a working class hero, played with feeling and passion. Anthony Hunt and Richard J Fletcher provide funny characterisations of a butcher and mechanic respectively, and Reece Richardson provides a true heavy weight performance as the player you wouldn’t want to mess with. For me however, the most amusing character was Phil played by Matt Connor, who as a golf-playing teacher, is clearly the odd man out, even though his rugby credentials are the best of the lot. Credit must also be given to Lauryn Redding who is superb as their tough-talking, no nonsense trainer. The casting all the round was excellent and full justice was done to a great play. Up ‘N’ Under is on until Saturday 21st October.